Germany may have their own Jamie Vardy fairytale after Hanover 96 striker Hendrik Weydandt, who was playing amateur football just four years ago, scored 75 seconds into his Bundesliga debut. Vardy, 31, went from playing amateur football to being a Premier League winner with Leicester City in the 2015-16 season before an England call-up followed. Weydandt is following a similar path in the Bundesliga. 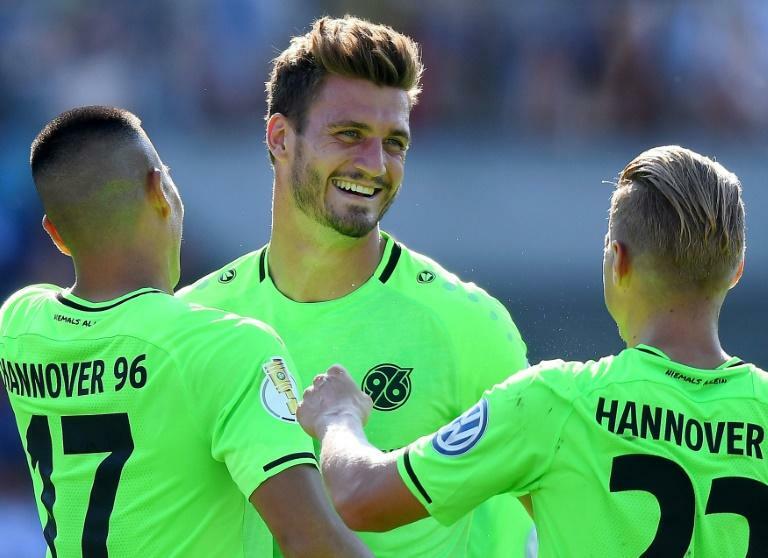 The 23-year-old, who played in Germany's seventh tier four years ago, scored soon after making his German league debut off the bench on Saturday in Hanover's 1-1 draw at Werder Bremen. He was plucked from Hanover's reserves at the start of the season having joined on a free transfer after 15 goals, with six assists, last season for fourth-tier side FC Germania Egestorf. He is on the verge of a first-team contract based on his performances over the last week, which are the stuff of dreams. The burly 1.95m (six foot, 5 inches) striker has three goals from three shots in professional football after also scoring twice inside eight minutes in the previous weekend's 6-0 German Cup win at Karlsruher. He declined to talk to reporters after his man-of-the-match debut in Bremen, but "the goals speak for themselves," said Hanover coach Andre Breitenreiter. "Of course, the story of 'Henne' is a fairytale, but one should not forget he has worked hard for it all and deserves it since he joined us. "He probably also thinks that he has to pinch himself, due to everything that is happening right now, but he is very grounded." In 2014, Weydandt was playing in Hanover's amateur city leagues - Germany's seventh tier before he went to Egestorf. After impressing Breitenreiter in Hanover's reserves, Weydandt grabbed his first-team opportunity. "I just wanted to see if he could show me his scoring qualities," Breitenreiter said. Now the full-time contract is on the cards. "It's crazy," said Hanover's director of sport Horst Heldt. "He was here for the entire pre-season, always listened well, put in the work and scored. "He is still young, but has all the skills that a centre forward needs - he's quick, he's tall and is strong in the header." Horst says the forward was a nervous wreck in the dressing room before kick-off. However, Weydandt showed no signs of nerves when he came on with 15 minutes left. He timed his run perfectly onto a chip over the defence and cooly tucked his shot under Bremen goalkeeper Jiri Pavlenka as if he regularly plays in front of 42,000. The smile and subdued celebrations suggested he was shocked to see the ball hit the net - "I would have expected more from his celebrations," said Heldt.